The snow is gone and the outdoor grilling season is here and TRUCK Contemporary Art in Calgary wants to see your artful videos based on accumulating, consuming, or preparing edibles under the sun. From valuable survival tips around en plein air cuisine to entertaining step-by-step grilling guides for your favorite patio provisions this thematic screening hopes to serve up some tummy tickling topics of entertainment. Bike-in Cinema is an outdoor screening series hosted by TRUCK Contemporary Art in Calgary’s CAMPER (Contemporary Art Mobile Public Exhibition Rig). 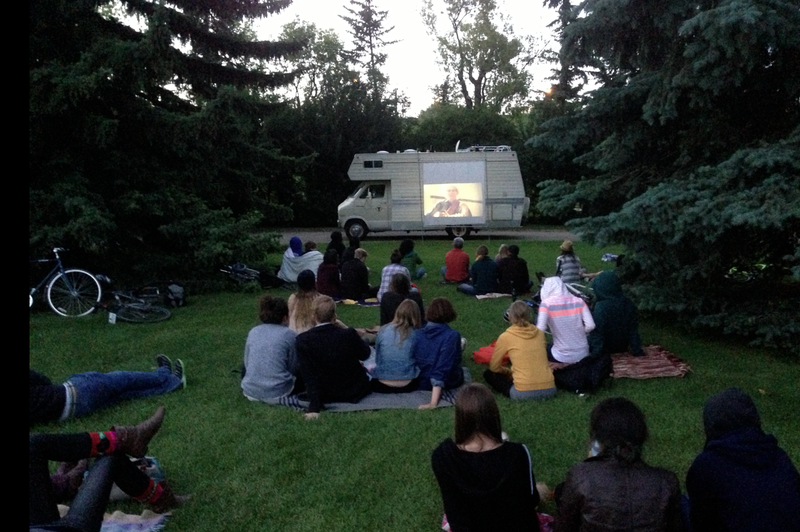 Using the CAMPER as a site for projection, Bike-in Cinema encourages exploration of Calgary’s urban environment, presenting screenings around the city. TRUCK Contemporary Art in Calgary is a non-profit artist-run centre dedicated to the development and public presentation of contemporary art. TRUCK’s CAMPER is a 1975 Dodge Empress motor-home, modified to become a portable public exhibition and project space. CAMPER’s mandate is to investigate the places where art, education and recreation meet, and to explore these intersections in a participatory manner that fosters public engagement and appreciation of contemporary art practices. Submissions will be accepted until Friday, May 16th, 2014 at 5:00PM. Films should not exceed 20 minutes in duration. 1. A brief film synopsis (maximum 250 words). 4. Film: Please submit only the film(s) you wish to be included in the screening. Films should be formatted as Quicktime movie files in H.264 codec limited to 8000kbps with a resolution of 1920 x 1080. Films should be no longer than 20 minutes in length. All written materials should be saved in a single PDF file and burned to a separate disc from your video. Must be Mac OSX compatible. Submissions will NOT be returned unless a self-addressed pre-paid envelope is included in your package. DO NOT E-MAIL SUBMISSIONS. Late, incomplete, faxed or e-mailed submissions will not be accepted. Please deliver or send via mail (submissions that are post-marked for May 16th will be accepted).